NASA's Mars Reconnaissance Orbiter has extended the long-armed antenna of its radar, preparing the instrument to begin probing for underground layers of Mars. 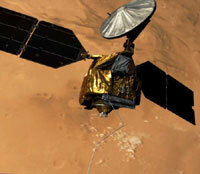 Artist concept of Mars Reconnaissance Orbiter during deployment of its radar antenna. The orbiter's Shallow Subsurface Radar, provided by the Italian Space Agency, will search to depths of about one kilometer (six-tenths of a mile) to find and map layers of ice, rock and, if present, liquid water. The radar's antenna had remained safely folded and tucked away throughout the flight to Mars from Aug. 12, 2005, to March 10, 2006, and while the orbiter used the friction of dipping into the top of Mars' atmosphere 426 times in the past six months to shrink the size of its orbit. Latches on the restraints were popped open on Sept. 16, and the spring-loaded twin arms of the antenna unfolded themselves. Subsequent information from the spacecraft indicates that each arm properly extended to its 5 meter (16.4 feet) length. "The deployment of the antenna has succeeded. It went exactly as planned," said Dr. Enrico Flamini, the Italian Space Agency's program manager for the Shallow Subsurface Radar. "Now the excitement builds about what the radar will find hiding beneath the surface of Mars." A radar-team engineer at NASA's Jet Propulsion Laboratory, Pasadena, Calif., Ali Safaeinili, said, "Motion sensors on Mars Reconnaisance Orbiter gave us good evidence that the antenna had deployed successfully. The amount of antenna vibrations as the arms unfolded was within the range anticipated." The radar received its first radio echo from the Martian surface during a test on Sept.18, providing a preliminary indication that the entire instrument is working properly. Researchers will use the instrument for more test observations at the end of this month. Communication with all spacecraft at Mars will be intermittent during most of October while that planet is behind the sun from Earth's perspective. The two-year-long main science phase of the Mars Reconnaissance Orbiter mission will begin in November. "We will use the Shallow Radar to map buried channels, to study the internal structure of ice caps and to see boundaries between layers of different materials," said Dr. Roberto Seu of the University of Rome La Sapienza, leader of the instrument's science team. "The data will provide our first detailed look just under the Martian surface, where ices might reside that would be accessible for future explorers." The radar instrument on the Mars Reconnaissance Orbiter will complement a similar instrument that went into use last year on the European Space Agency's Mars Express orbiter, the Mars Advanced Radar for Subsurface and Ionospheric Sounding. The two instruments use different radar frequencies. The one on Mars Reconnaissance Orbiter can discriminate between thinner layers, but cannot penetrate as deep underground, compared with the one on Mars Express. Both result from Italian and American partnership in using radar for planetary probes. Alcatel Alenia Spazio-Italia, in Rome, is the Italian Space Agency's prime contractor for the instrument. Astro Aerospace, of Carpineria, Calif., a business unit of Los Angeles-based Northrop Grumman Corp., developed the antenna as a subcontractor to Alcatel Alenia. Further information about the Shallow Subsurface Radar is online at www.sharad.org. The mission is managed by JPL, a division of the California Institute of Technology, Pasadena, for the NASA Science Mission Directorate, Washington. Lockheed Martin Space Systems, Denver, is the prime contractor and built the orbiter.